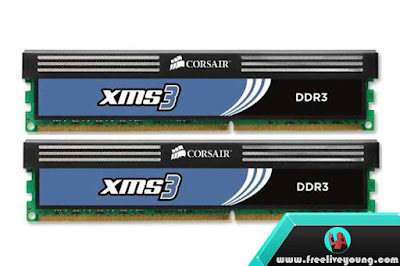 Freeliveyoung.com - List of Best DDR3 RAM Brands 2017 - Type and Brand of Best DDR3 RAM 2017 - For PC upgrading purposes, usually, one of the things that become a benchmark is a RAM or Memory Kit. The greater the capacity of the RAM the better the performance. But not only the capacity that we should prioritize in choosing a RAM for PC upgrade, but the quality of RAM or Memory Kit is also to be we really make sure. For that, we must be really keen on seeing the specifications of a RAM before we buy it. It's good before deciding to buy RAM, you should ask or ask advice to friends or others who can be trusted. If necessary please request a review of the people who have never used the RAM you want to buy it. Here is a list of types and brands of the best DDR3 RAM Memory Kit 2017. RAM DDR3 Crucial Ballistix has a fairly low voltage, which is 1.35 volts and with good speed.This RAM has the ability to overclock and latency is very optimal. RAM is arguably the best for now with its low voltage and good performance. If you are looking for good quality RAM and a suitable price, then maybe you will look for RAM G. Skill Ripjaws. Performance of RAM G. Skill Ripjaws is very good as well as having optimal overclocking. But this type of RAM is quite expensive when compared with other types of RAM with the same class. For gamers, this type of RAM is probably the most popular. Most gamers today like this type of RAM because this RAM is perfect for juxtaposed with Gigabyte motherboards. How Much RAM Capacity Needed By A Gaming PC? Actually, it depends on the target and your own budget. If you have enough budget, then I recommend buying RAM with a capacity of 16GB (2x8GB) in order to make your PC performance more optimal. But if you have a limited budget, then the RAM with 8GB capacity (2x4GB) is also quite good. And what I mean by "target" is the specification of the game you want to play. If the game you want to play has a minimum specification that is high enough, then you should just adjust it. Do not force to play heavy games if the minimum spec is not met because it will have a bad impact on RAM and other hardware. Thanks for reading List of Best DDR3 RAM Brands 2017. Read too 5 Best VGA For 3D Rendering and Video Editing.